On Thursday, September 19th at 9 am, Austin City Council members joined volunteers from the Friends of Barton Springs Pool, city staff, and other pool stakeholders (including Clean Water Action, Environment Texas, Preservation Austin, Save Barton Creek Association, Save Our Springs Alliance, and Sierra Club of Austin) at the first official “Council FIXES the Pool Day” to review the many Council-approved improvement projects for Barton Springs Pool and the surrounding area for the purpose of recognizing City Council for their work to support Barton Springs. 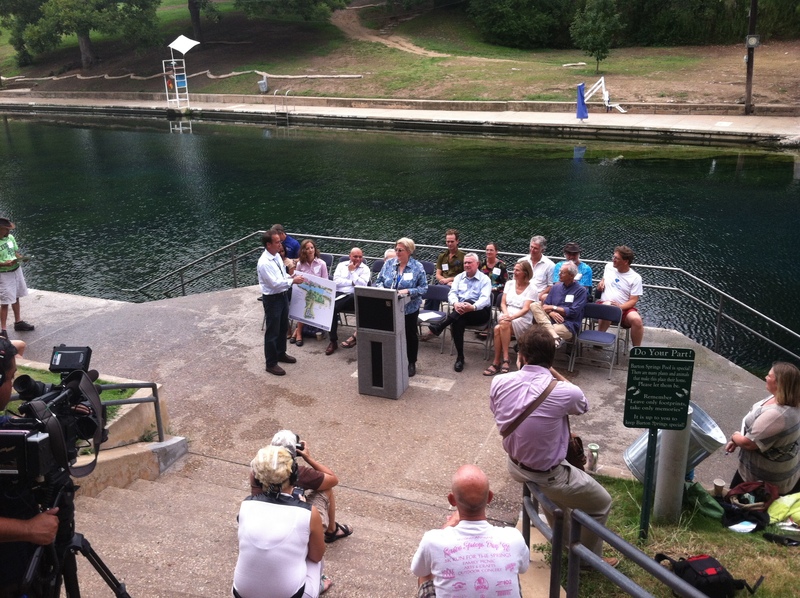 The event kicked off at 9 am with a short press conference presentation by pool stakeholders of recent Barton Springs Pool projects supported by City Council, followed comments from the City Councilmembers in attendance. After the press conference, a “pool snorkeling tour” was conducted with Councilmembers Morrison and Tovo to review firsthand the pool features and improvements. Mayor Lee Leffingwell, Mayor Pro Tem Sheryl Cole, and City Council Members Mike Martinez, Laura Morrison, Chris Riley, and Kathie Tovo all attended, with Bill Spelman would have attended but for a last-minute family commitment. Additional information from the Press Release are posted here.